Wethepeople PRO Ed Zunda just built up a fresh setup for 2019. That Pastel Mint AWAKE Frame looks incredible with the all black parts package. Ed recently made the switch to our INDEX frontload stem and our new HELIX complete wheels. Find out more about Ed’s new setup and why he’s so stoked on it. 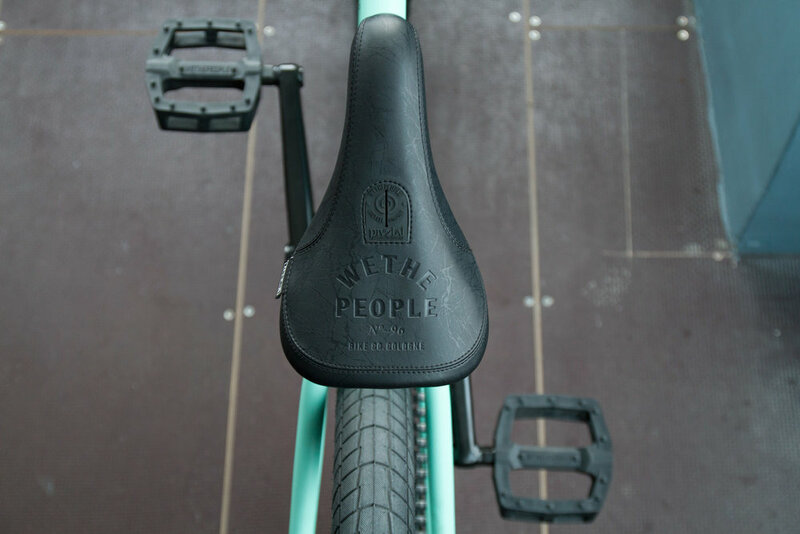 You’ve recently joined a few others on the Wethepeople team and made the switch back to a frontload stem and slim seat. Was there a specific reason behind this? Do you think this is a new “trend” which will catch on with more riders? I’ve had a slim seat for a few years now actually. I started with the move back to a Mid and then switched it to a slim pivotal last year. It just looks sleeker and cleaner. I don’t really see the point of needing a fat seat unless you sit down all day. With the stem, it’s kinda the same, it just looks nicer in my opinion. It was time for a change and i’ve never liked super tall bars anyway. It looks super nice and feels perfect for me. The Index Stem is cool because it actually gives you more rise than a regular frontload, but still has the clean look. Hard to say if it’s a trend but i think more riders will for sure try it out now since riders like to switch it up and try something new. What kind of modifications do you have to do to your bike when building up a fresh one? You’re riding the new Wethepeople Helix Freecoaster, can you explain some of the advantages and changes on this new version? I actually took it apart when I got it, and instantly realised how much easier it is to work on because of the push on cone on the driver side. You don’t need a wrench any more which is great, so providing you have a hammer/mallet/wood you can service your hub whilst you’re in the streets. The hub works perfect and is super smooth, the friction is more stable and the axle is beefier which is only a good thing. I like that is comes with guards too, way more convenient and less hassle trying to find guard that fit. The new Wethepeople Logic pedals have dropped and by the sounds of it you had a lot of input on the design. What exactly is important to you when it comes to a pedal and what was some of the input you gave the design team? It was a great experience since I’m super picky and specific about pedals. I personally like when the platform is bigger, its nicer on the feet and puts less stress on them. Plenty of pins, and larger size pins so they don’t wear down as fast. Super important that they are strong, no one wants to snap a pedal on a big landing. The Logics pedals fit the rest of the WTP line which is important for me since I ride a full 100% setup and i want my ride to look clean. How do you deal with living in such a cold country during the winter and how do you still keep up with riding when the weather is bad? It’s hard, I can’t lie. You have to stay positive. Luckily we have a good indoor spot which I get to ride every day. Winter is slow but you have to just concentrate on the good weather and travelling the rest of the year. I wish haha! It’s hard, you just got to find that magic point. Some days they work perfect, others not so good. You just have to keep working at them and it will happen.